We are all feeling changes to our weather - changes in rainfall, more heat waves and more severe and larger storms. We are also seeing the impacts - drought, wildfires and floods. All these are changes predicted from climate change and they are already happening now. The choices we make in the next 15-20 years are very important in protecting our health and our future. The good news is that we have the solutions we need today to achieve this and they don’t need to turn our lives upside down. How will climate change affect us? How can a few degrees make such a difference? What is the time line and when do we need to make changes? Find answers to the most common questions on climate change below. Climate change is happening faster than predicted even a few years ago. We don’t have 50 or 100 years to address climate change, we need to move forward now with solutions to prevent more serious effects in the future. Science has identified a clear limit, we must keep climate warming below 3.6°F (2°C) to avoid severe consequences. However, we have already warmed the climate by 1.5°F, mostly since 1970. If we continue with this level of emissions we will pass 3.6°F in 20-30 years. Even though it will take time to see all of the impacts, we are creating the emissions today. If we continue on our current path, our children in school today will face severe consequences in their lifetimes. 196 countries, including the U.S., have agreed to the importance of staying below 3.6°F and have made commitments to work towards this goal. However, the commitments made so far are not strong enough to succeed. In order to reach these goals it will require more than government action, it will require everyone taking part. The good news is we have the solutions and there are many things we can all do, choices we can make, that will help out and support the effort. The better news is that most of these choices will actually also improve our health, save money and create jobs. Our community can make a difference and together we can help build a strong and safe future for our children. From severe drought in the West to extreme storms in the East, we are seeing the effects of climate change now. Effects vary across regions, but the impacts are due to the same underlying cause – emissions of carbon dioxide and other greenhouse gases that are increasing the global average temperature. Learn more about how this is happening in our FAQ section. Below are some of the main impacts predicted from climate change. Learn more at the U.S. National Climate Assessment website. As the climate warms, there will be less and less snowfall in many areas. Snow acts as a natural holding tank for water – the water is frozen during the winter and becomes available during the spring when the snow melts. If there is less snowfall, there will be less water in our streams and rivers during the spring and summer to use for watering crops and providing drinking water. In addition to less snow, in some areas like the Southwest, the amount of annual rainfall will also decrease creating severe drought and further impacting water supply. Changes to our water supply will affect our food supply. Less water available for growing crops will lower crop yields and is already affecting food production in many states. Changes in weather patterns are also having an impact on food production. Most crops have specific temperature or rainfall needs at specific times. For example, cherry trees require a certain number of days below freezing in order to bloom. With warmer winters, in some areas cherry trees are not blooming and this has reduced cherry crop yields in recent years. Both of these effects will lower crop yields and increase food prices. With less rain and higher temperatures, many trees in the forest are dying early. This is being accelerated by insects and diseases that attack the trees when they are weakened from these more stressful conditions. Long periods of drought, high heat days and dead trees in the forest all lead to conditions that greatly increase the risk of wildfires. Wildfires have already increased in frequency and intensity in the U.S. and are expected to continue to increase with continued warming. Sea level rise happens slowly, but even a small rise in sea level will affect millions of people around the world. Sea level has already risen about 8 inches and is expected to rise another 1-4 feet or higher by 2100. In the U.S., nearly 5 million people live within 4 feet of sea level. Sea level rise will threaten the safety and homes of those living in low lying areas. With only 3 feet of sea level rise, large populated areas of Florida, California, Louisiana and other states will be underwater. Coastal storms, like Hurricane Sandy, will become more destructive as higher water levels create more damage with storm surges. Storms across the U.S. will also become larger and stronger, creating more damage and flooding. One of the biggest threats of climate change is loss of species. As humans, we are able to adapt to changes in temperature or rainfall. If it’s a bit colder we put on a sweater, if it’s a bit warmer we put on shorts. However for nearly all of the other species on the planet, it is not so easy. All species, except mammals, have a very narrow range of temperature and rainfall that they need to survive. When these conditions change, they are unable to adapt. However, most species can’t just relocate. Trees can’t just walk hundreds of miles north to the new area where their ideal environment is now located. The faster the climate changes, the more species are at risk. If species are not able to adapt, they face extinction. When one species goes extinct, all of the other species that depend on them for food or shelter are then also threatened. Climate change is affecting the oceans. Up to a quarter of all carbon dioxide emissions are being absorbed by the oceans and this is changing the ocean's chemistry. When carbon dioxide is added to water it becomes more acidic. Ocean surface waters have become 30% more acidic over the last 250 years since we began burning fossil fuels. The biggest impact is to animals with shells and coral reefs. When water is more acidic, the shells of animals like oysters and clams begin to dissolve. If this process continues it will threaten these species with extinction. Many animals with shells are very important in the ocean food chain and their extinction would remove the main food source for many other animals like whales and fish. How does our climate work? Our atmosphere acts like a blanket, warming our planet and making life possible. You can see our atmosphere – it is the beautiful fuzzy blue line around the earth in the photo to the right. When sunlight hits the Earth, the heat from the sun bounces off to return to space. Our atmosphere has gases which trap some of the heat as it tries to leave, which warms our planet. This is called the Greenhouse Effect. The amount of heat trapped determines our climate. 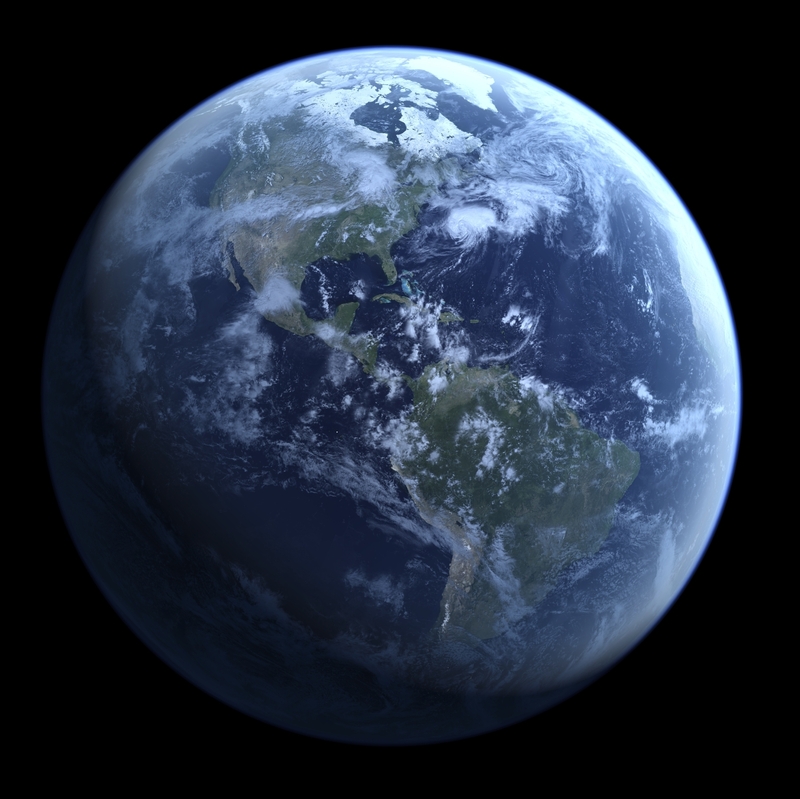 If we did not have any atmosphere, or very little greenhouse gas the Earth would be a frozen ball of ice like Mars and would not support life. However, too much greenhouse gas in the atmosphere and Earth would be too hot to live on like Venus. For the last 10,000 years our atmosphere has been stable, with a climate that is just right - not too hot and not too cold. This stable atmosphere has allowed human civilizations to grow and thrive. What causes greenhouse gases and our climate to change? Greenhouse gases are now increasing in our atmosphere which is causing our climate to warm. This is happening as a result of human activities. The primary greenhouse gas, carbon dioxide, is created whenever we burn fossil fuels - coal, oil or natural gas. We burn these fuels in everyday activities like driving cars, heating buildings, and making electricity. 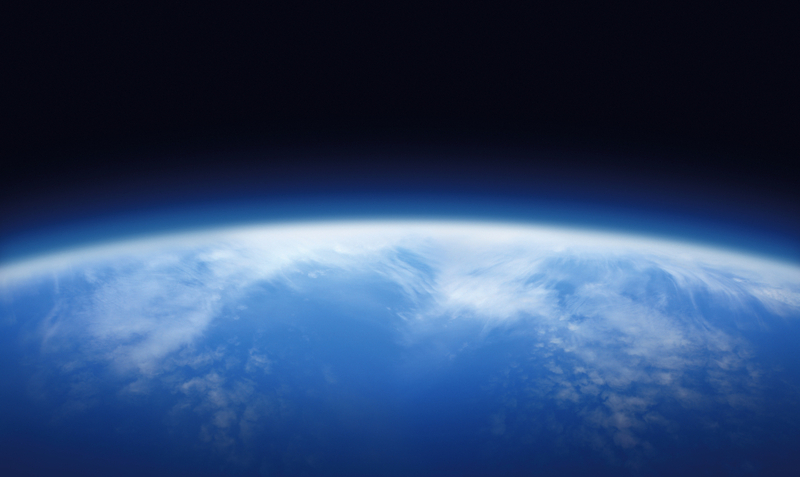 Carbon dioxide, once emitted, stays in the atmosphere for a very long time - up to thousands of years. In order to stop the warming we need to transition to new fuel sources that do not create greenhouse gases, like solar and wind energy. Fortunately we have the technology we need to make this transition and the cost for these energy sources has dropped drastically in recent years. Learn more about this technology on the Solutions page. The atmosphere determines our global average temperature. As we add greenhouse gases, the global average temperature increases. This increase in average temperature creates average trends like decreased snowfall, more rainfall, larger storms and warmer oceans. However, these are global trends and do not determine the local climate or weather in a particular area. 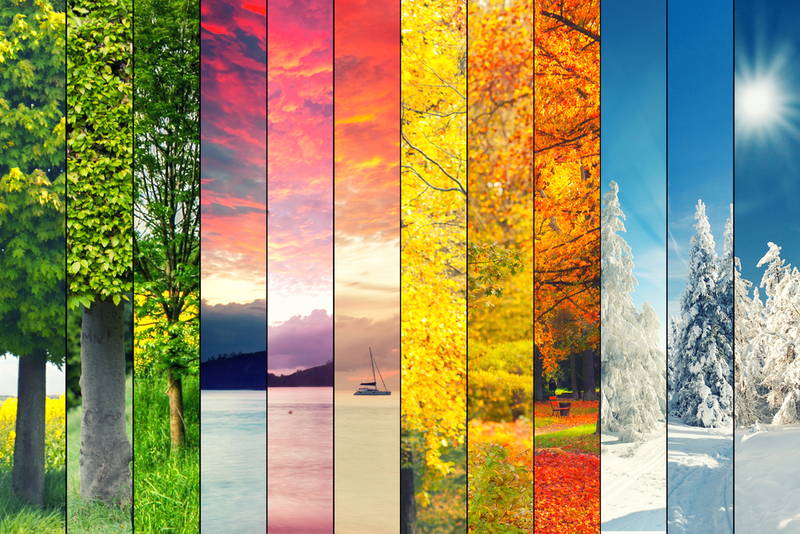 The change in local weather patterns from climate warming varies. Some areas may see much higher temperatures and less rainfall, others may see an increase in rainfall and some more extreme cold days. An extra cold winter in one area does not mean that the average climate across the world is not warming. 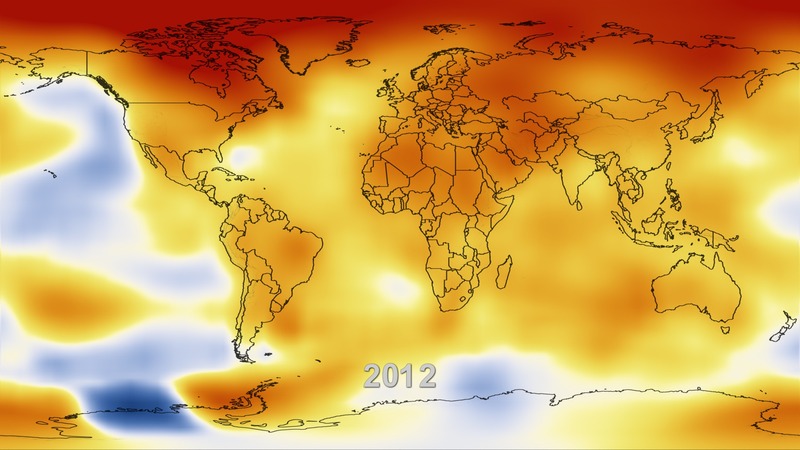 Scientists have been tracking the average global temperature by taking measurements in many places around the world. They have established that the global average temperature is increasing. It has increased by about 1.5°F since 1750 when we started to burn fossil fuels, with most of the warming happening since 1970. It’s only a few degrees, how does that matter? How can a change of a few degrees in temperatures have a big impact? To humans, a few degrees doesn’t sound like much, it is not even the difference between a t-shirt or a sweater. However, we are not talking about a few degrees change in the local weather. We are talking about a change in the average global temperature. A few degrees difference in the global average temperature creates big changes in our world. The global average temperature during the last ice age, 20,000 years ago, was only about 7°F colder than today. However, sea level at the peak of the last ice age was 394 feet lower than it is today. Climate change of only a few degrees will create big changes in our world including widespread changes in regional and local temperatures, rainfall, snowfall, the size of and frequency of storms and the sea level. These changes also have a huge impact on our ecosystems and other species as they have difficulty adapting to these extreme changes. The faster the change, the harder it is for species to adapt. Climate change we are experiencing now is happening far more rapidly than natural climate changes in history and this is threatening many species. Climate change has happened before, isn't this a natural process? 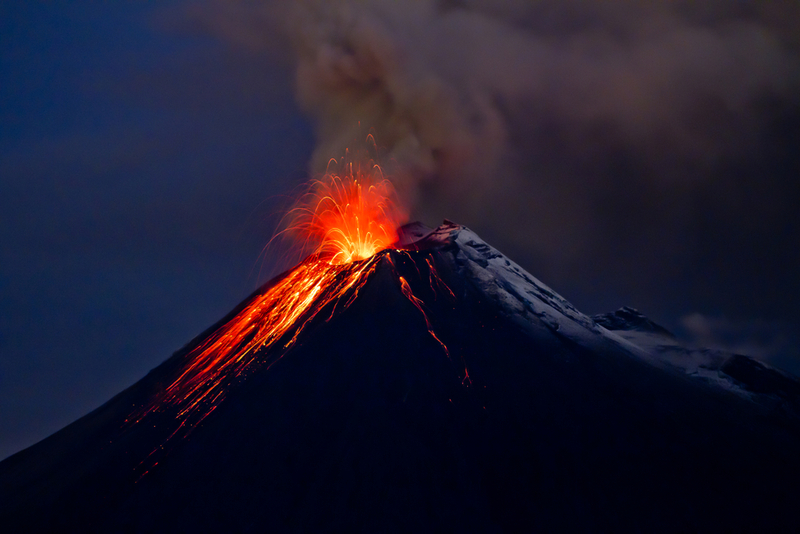 Volcanoes emit aerosol particles that can reach the atmosphere and block the sun, producing a cooling effect. The sun’s intensity changes on natural cycles, affecting the amount of energy we receive from the sun. The current 11-year solar cycle is producing the lowest solar output since the mid 1900’s which should produce a cooling effect, not the warming we are observing. Changes in the Earth’s orbit and tilt have been the primary driving force for the ice age cycles over the past 800,000 years. However, these changes in Earth’s orbit and tilt happen very slowly, with the associated warming or cooling happening over tens to hundreds of thousands of years. All of these natural processes can be measured, however, scientists have found that these natural causes are not explaining the warming we see today. The cause of the current warming is emissions of carbon dioxide and other greenhouse gases. The historical scientific evidence clearly shows a direct link between the levels of carbon dioxide (CO2) in the atmosphere and the global average temperature. This relationship is well established and 97% of scientists agree that the current changes in our climate are due to human activities, specifically human activities creating carbon dioxide and other greenhouse gas emissions. The biggest difference between current warming and the climate changes in history is the speed at which it is happening. We are currently warming the Earth many times faster than natural cycles. The faster we change the climate, the more difficult it is for other species on the planet to adapt. Even slower climate change events in history have resulted in species extinction. Our current rapid speed of warming threatens significant species extinction. In 2008, China became the country with the highest annual CO2 emissions (graph to the right). However, prior to this, that spot was held by the U.S. China’s increased emissions are due to increased development and industrialization in the country. However, a significant portion of this development and increase in China’s emissions is from producing goods that are made for U.S. consumers. Over the last 20 years many U.S. companies have moved production overseas to China. This has reduced our U.S. emissions and increased emissions in China. Consumers in the U.S. and other countries share responsibility for the increase in China's emissions. With climate change, it is actually the total emissions of CO2 and greenhouse gases over time that determine the impact on climate. If we look at this measure of total responsibility, the picture looks quite different (graph middle right). 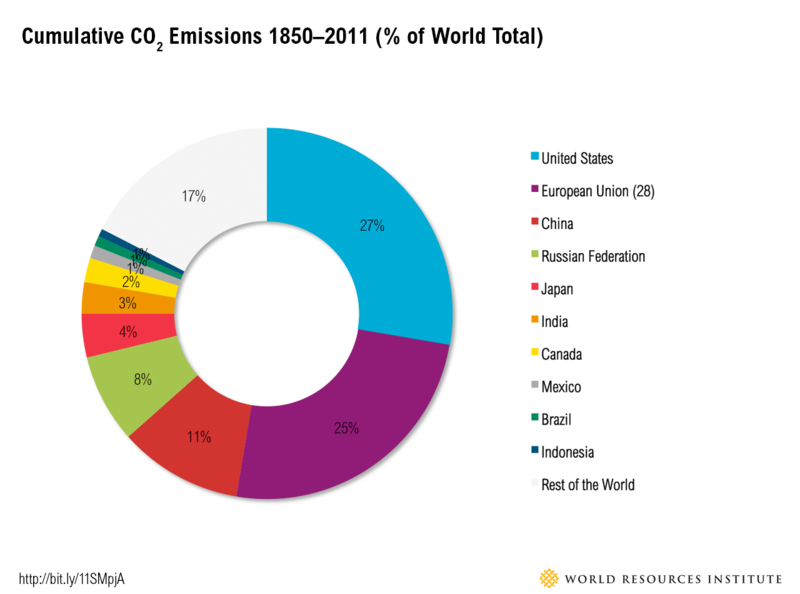 Here the U.S. clearly has the most responsibility for total emissions to date. 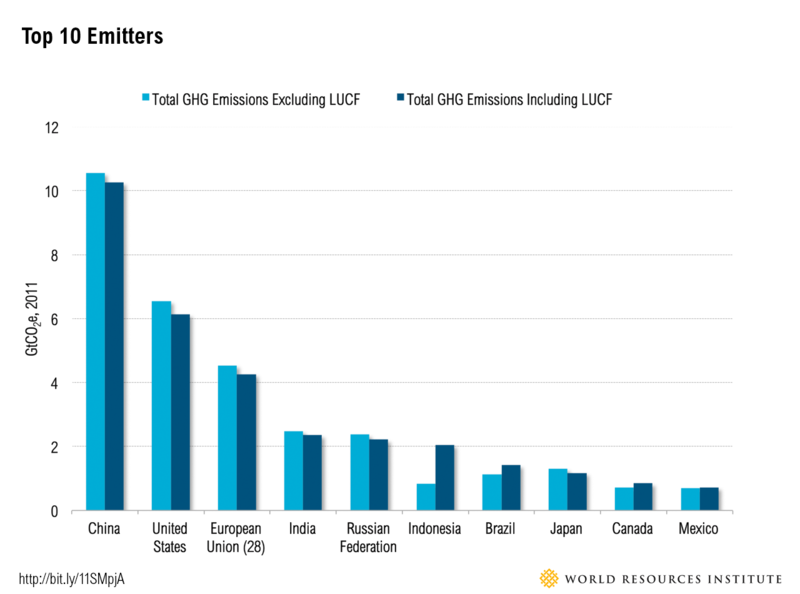 If we look at this in emissions per person across the top emitters the picture changes again (graph bottom right). Here the U.S. again has one of the highest emissions. 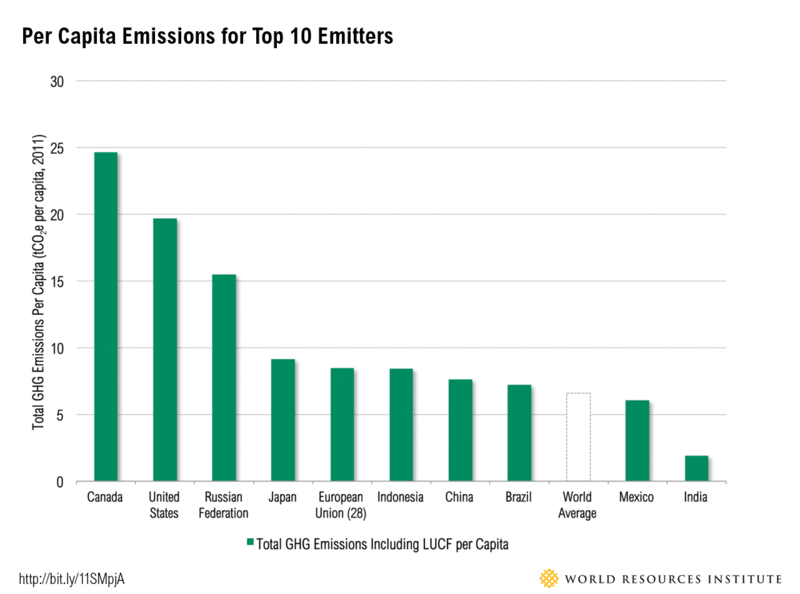 China, India, Brazil and the world average emissions per person are much lower than in the U.S.
China has a responsibility to lower emissions along with the U.S. and all other emitting countries. China’s actions will be critical in addressing climate change. China has made strong commitments along with the U.S. and 196 other countries to reduce carbon dioxide and greenhouse gas emissions. China has also helped the global transition away from fossil fuels by making a substantial investment in solar manufacturing. This investment is one of the main reasons the price of solar has dropped so dramatically in recent years. With the largest responsibility for emissions over time and the most resources of any country in the world, the U.S. must lead in this effort. We have the technology and the solutions, all we need is to make the decision to move this forward. This transition has the opportunity to create jobs and many other benefits. We will be in the strongest position to strengthen our economy by leading and developing the skills and the markets for the technology that will drive this transition globally. Most importantly, we need to lead to create a safe and healthy future for our children. How will this affect my family and my job? Many people worry that the costs of addressing climate change will affect their jobs and their family. However, the cost of not taking action has a far greater potential impact. The impacts of climate change will be broad and affect most people in the U.S. As the climate continues to warm, food and water prices will rise in most areas. For some families, there will be the costs of damage from severe storms or flooding. If you live near the ocean, storm surges or sea level rise could impact your home or business. The damage from Hurricane Sandy alone cost $50 billion, and Hurricane Katrina $108 billion. These impacts will risk jobs and increase family expenses. They also threaten our health and safety. The faster we make the transition to clean, renewable energy sources, the lower the impacts will be in the future. The cost of clean, renewable energy has decreased dramatically in the last few years, making the transition to clean energy far less expensive than predicted even a few years ago. We don't need to choose between economic prosperity and addressing climate change. Solar and wind technologies are now equivalent to the cost of fossil fuel energy in many areas in the U.S., and in some places cheaper. Better yet, there are many additional benefits from the transition. Prices for renewable energy will continue to drop and in the long run will actually lower energy costs for families. Manufacturing and installation of new technologies will create hundreds of thousands of local, U.S. jobs and new opportunities for families. 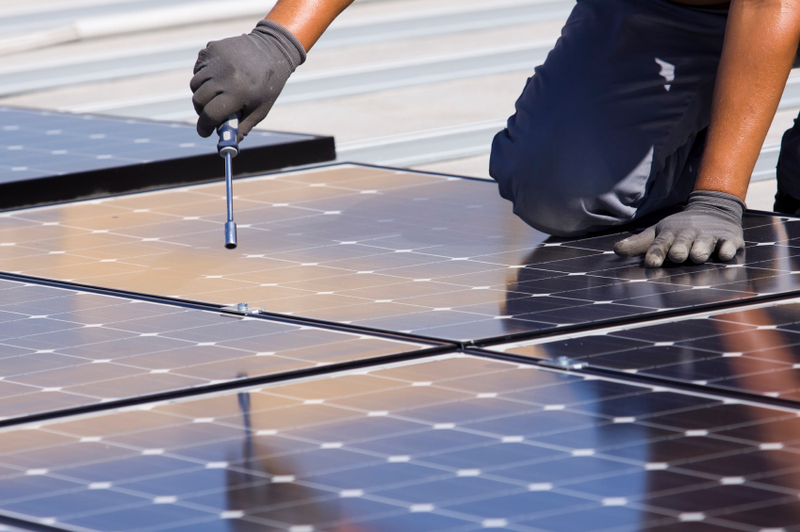 The solar industry is currently one of the fastest growing industries in the country. Electric cars are much cheaper to operate than gasoline vehicles, and will save families significantly on transportation costs. A small number of workers will lose jobs in the fossil fuel industry, however, we can and should provide assistance and job training to help them transition to new jobs and industries. Finally, the transition away from fossil fuels will also greatly improve our health. Electric vehicles do not emit the harmful tailpipe air pollution that creates smog. Image a world with no more smog! This alone will save thousands of lives and create a safer, healthier atmosphere for our children. Overall, this transition will be a benefit to our economy, our quality of life and to families across the U.S.
Will impacts affect everyone equally? In short, no. Although all countries will experience the impacts of climate change, it is those with the fewest resources that will often be impacted first and most severely. Many of the early impacts of climate change are being felt in some of the poorest areas of the world. In Africa, many countries have been experiencing historic droughts caused by climate change for a few decades. These droughts are creating water and food shortages, and are one of the main underlying causes for some of the conflicts we see today, such as in Sudan and Syria. Even though the droughts are in one country or region, the conflicts emerging over resources can impact many other countries, including the U.S. Refugees from climate impacts or conflicts over scarce resources and relief aid will impact many countries across the world. 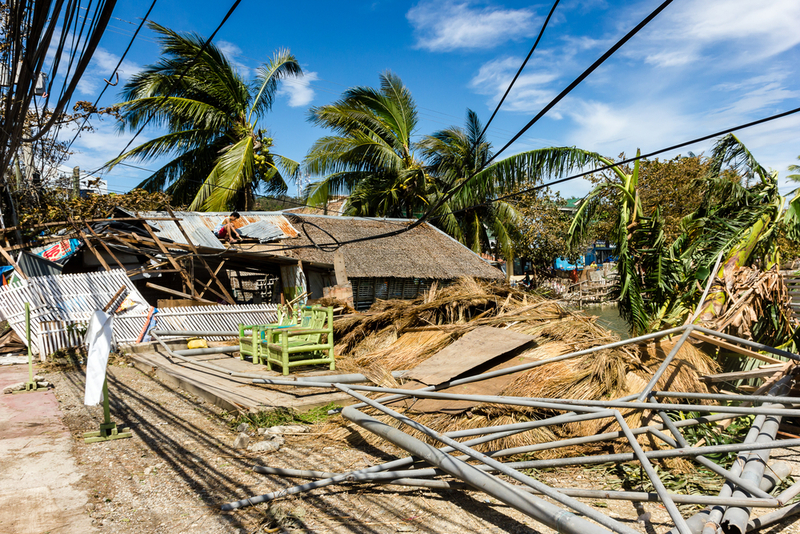 In the Philippines, typhoon Haiyan destroyed over 1 million homes and displaced over 4 million people. These countries have been hit the hardest, yet they have the least responsibility for creating the problem and the least resources to deal with the impacts. This applies not only to other countries, but to neighborhoods and families in the U.S. as well. The health impacts of fossil fuels are much higher in disadvantaged communities where fossil fuel power plants and emission tend to be much higher than in other communities. As the country with the highest total emissions and one of the highest emissions per person, we have a responsibility as neighbors and the opportunity to make the biggest impact by making the transition to clean renewable energy sources.